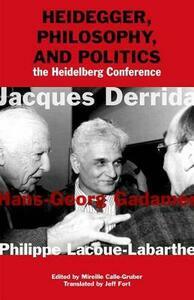 In February 1988, philosophers Jacques Derrida, Hans-Georg Gadamer, and Philippe Lacoue-Labarthe came together in Heidelberg before a large audience to discuss the philosophical and political implications of Martin Heidegger's thought. This event took place in the very amphitheater in which, more than fifty years earlier, Heidegger, as rector of the University of Freiburg and a member of the Nazi Party, had given a speech entitled "The University in the New Reich." Heidegger's involvement in Nazism has always been, and will remain, an indelible scandal, but what is its real relation to his work and thought? And what are the responsibilities of those who read this work, who analyze and elaborate this thought? Conversely, what is at stake in the wholesale dismissal of this important but compromised twentieth-century philosopher? In 1988, in the wake of the recent publication of Victor Farias's Heidegger and Nazism, and of the heated debates that ensued, these questions had become more pressing than ever. The reflections presented by three of the most prominent of Heidegger's readers, improvised in French and transcribed here, were an attempt to approach these questions before a broad public, but with a depth of knowledge and a complex sense of the questions at issue that have been often lacking in the press. Ranging over two days and including exchanges with one another and with the audience, the discussions pursued by these major thinkers remain highly relevant today, especially following the publication of Heidegger's already notorious "Black Notebooks," which have added another chapter to the ongoing debates over this contested figure. The present volume recalls a highly charged moment in this history, while also drawing the debate toward its most essential questions.